I was absolutely elated when Ippon asked if I would like to do my summer internship at the Paris office. I had spent a semester in the City of Lights while in college, and it held a special place in my heart. I wasn’t sure what to expect working in Paris for the summer. I knew it would be different than working at the Richmond office, but I wasn’t sure what was in store. I wake up, get dressed and head to work around 8:45am. It is about a 30 minute commute to work each day. I usually stop by the local boulangerie and grab a pain au chocolat before I hop on the métro to work. I arrive at the office around 9:30am. The office is full of handshakes, la bise, and espressos, with everyone greeting each other good morning. My team assembles in a meeting room to do our daily stand up. We all go around the room and talk about what we accomplished the previous day, and our goals for the current day. After few hours of work, it’s time for lunch. A few of the other interns talk about going to Burger King (a huge hit in Paris) or Subway for lunch. But I prefer to stick to the more traditional French lunch places! I grab a jambon et emmental sandwich and tarte au chocolat from the local bakery and head back to work to eat on the terrace. When the weather is nice, the terrace is packed with everyone wanting to enjoy a bit of sunshine during the lunch hour. Located on the 8th floor, overlooking Avenue de la Grande Armee, it has a spectacular view of the city. The Arc de Triomphe shadows over the right, while in the distance to the left is La Defense. 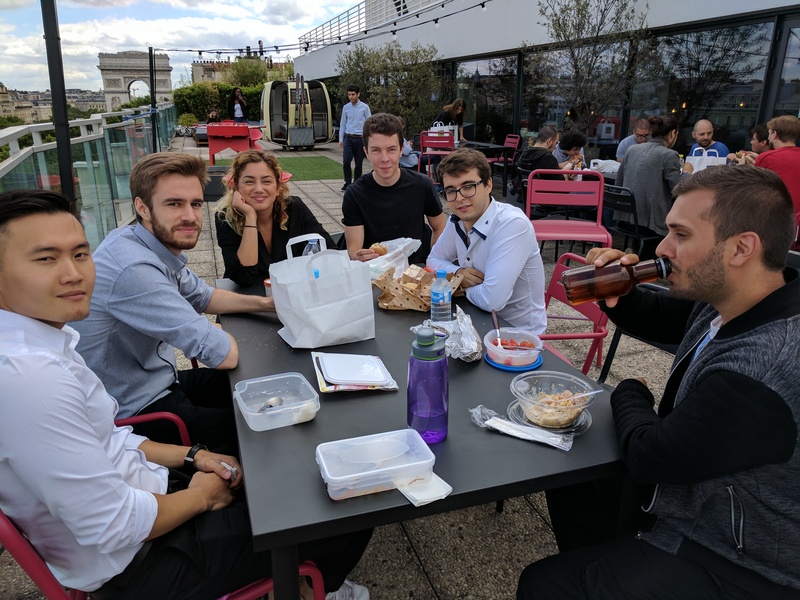 The terrace is definitely one of the highlights of the Paris office! Other days I wander to a nearby park to eat lunch and read a book. Parks in Paris are the perfect spot to escape the noise of the city for a little bit. The parks are always filled with people eating lunch, reading books, or just people gazing. All of the parks in Paris are beautiful, each one having its own unique charm! The workday ends between 6 and 6:30pm. I head home on the métro, usually stopping by a market along the way to grab things for dinner. Although the number of nights I’ve ended up just eating an entire baguette and cheese is too many! After I get home and change out of my work clothes, I sometimes explore the city. It’s fun to walk around different neighborhoods and see what is there. There are tiny shops, boulangeries, and restaurants nestled in every corner of Paris. 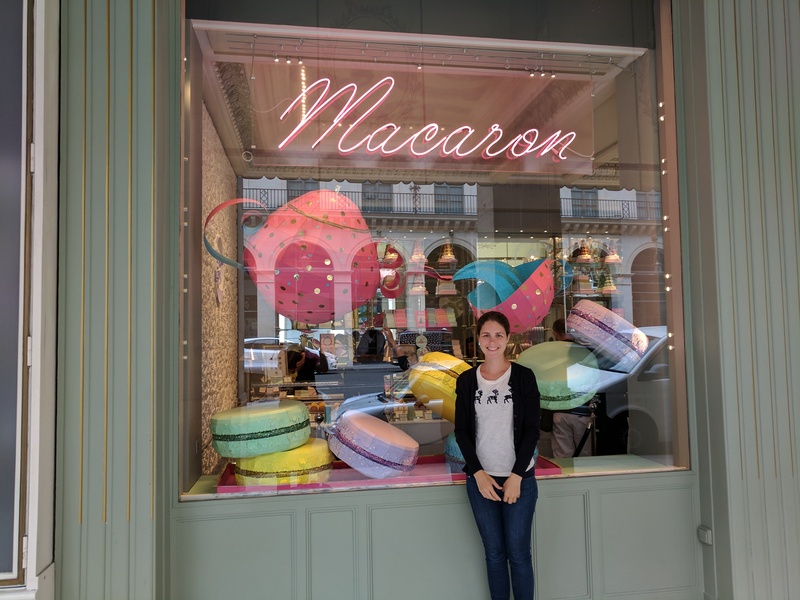 I love walking around and popping in different stores, or buying different pastries from all of the bakeries in the city! My apartment is located in the 11ème arrondissement of Paris. It is in a really cool part of the city, close to the Marais and the Centre Pompidou. I had not spent a lot of time in this part of the city previously, so it is really fun to explore new cafés, shops, and boulangeries! Working in Paris is much more of a challenge than working in Richmond. Everyone is super friendly, but the language skills required for working in an office environment are completely different than simply taking French classes. The first few weeks were tough, when I was trying to remember French conjugations and how to ask for “the check” at a restaurant. Having meetings with others can sometimes be tricky. Parisians talk FAST! Sometimes you just have to ask someone to repeat themselves and talk a tiny bit slower. It can be tricky sometimes, especially when discussing work-related topics, as most of the vocabulary is new! One advantage that I have is that the programming languages are in English! The languages do not change from one country to another. This means that most websites about these topics are also in English. This definitely makes work a tiny bit easier! I am working with a team of about 8 developers to create a website for a large utility company that deals with water treatment and waste management. We are upgrading their website that allows them to manage all of their waste management containers around the world. It’s really great to be able to work on such a large project and participate in demos with the client every two weeks. There are many different projects going on in the office. It’s fantastic to be able to have so many knowledgeable people all in one spot. Everyone has a different expertise, so questions never go unanswered. I have learned so much this summer, not only about programming, but also about the interactions between clients and consultants. Working in Paris has been a great experience. 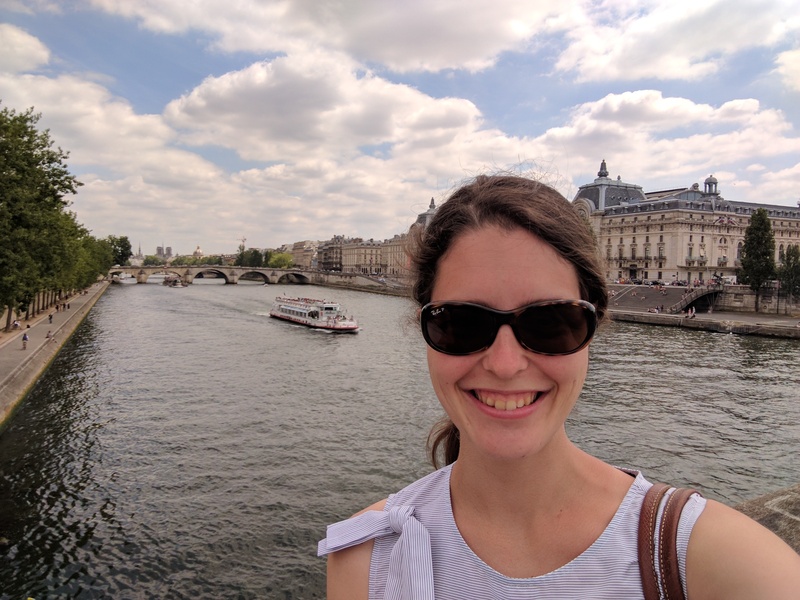 This summer has been more than just a summer abroad; I was able to learn and experience a new part of French culture that you can only learn by working in a French office. Customs and business etiquette vary from culture to culture, and it was very interesting to see the differences between working in the US and working in France. I will be sad to leave, but very grateful for the experience to work in Paris for the summer and for everyone who has worked with me to make this experience possible. This is just one of the perks of working for a global company such as Ippon!